Today only, get a free scoop of Swiss Miss Hot Chocolate ice cream at participating Carvel stores. Valid Thursday, Sept. 23, 2010, only. The freebie scoop is 3 ounces, so not huge but a very nice treat. 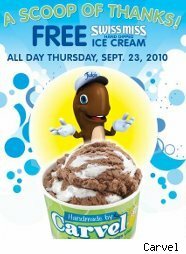 Carvel is giving away the free ice cream as part of its annual customer-appreciation day. No coupon needed. Caveats: not valid with any other offer. Thanks, Its Hip to Save!